CAPE MAY, N.J. ― The Coast Guard assisted four people who were aboard a disabled 44-foot sailboat about one mile offshore from Cape May Inlet Saturday. A 45-foot Response Boat ― Medium crew from Coast Guard Station Cape May was already underway at 1:15 p.m. when crewmembers noticed an unusual-looking sailboat. 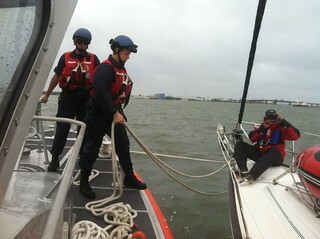 The response boat crew towed the sailboat away from nearby shoal water and into the Cape May Inlet, where the Coast Guard crew passed the tow to commercial tow boat operators who took the sailboat and crew to Utsch’s Marina in Cape May.